The Hotshot ABo Line Output Selector is a highly useful and well-built signal switcher that allows you to change the destination of the signal you input. It can be used for communication among sound crew and band; switching between dry and affected signals or between normal and "weird" FX; for talkback purposes in the studio; or as a simple mute switch to keep unwanted sounds out of the mix. Constructed from 14-gauge steel, the Hotshot ABo is built to take the abuse that comes with pro-level use. Versatile and long-lasting, the Hotshot ABo is a high-quality signal switcher that will give years of reliable service. 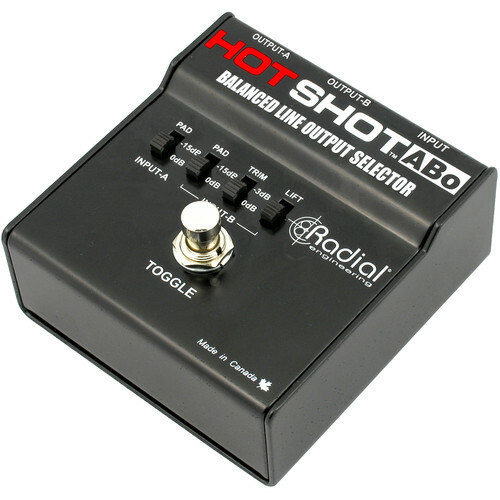 From talkback box to cough mute pedal to effects manipulator, the Hotshot ABo has a variety of applications, and offers the same signal integrity and reliability in any situation. A chassis of 14-gauge steel with a heavy-duty, high-cycle footswitch give this switcher the strength and durability to withstand life on the road. Box Dimensions (LxWxH) 6.4 x 4.3 x 3.0"